Rachel is a fully licensed stylist and currently in our associate program training under our most senior stylists. Her favorite things about starting this career in the beauty industry are her love for hair color and creative makeup. When it comes to hair color she especially likes to do blonding and balayage techniques as well as vivid colors. 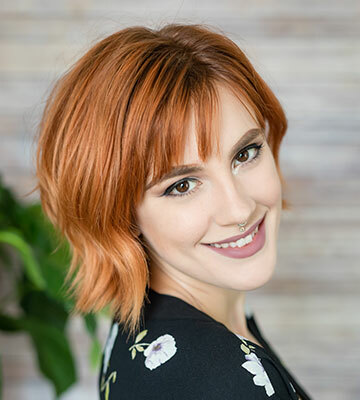 When you receive a hair color or cut with Rachel a senior stylist will oversee and check all of her work for level 1 pricing! When Rachel is off she enjoys going on day trips, spending time outside, shopping, reading, going to the gym and living a healthy lifestyle. Rachel serves guests Wednesday and Thursday 3-9, Friday 10-7, most Saturdays 8-4 and every other Sunday 9-3.